If you’re a vegetarian and haven’t yet been to the Reggae Shack, you best correct that right away. It’s just good food. I know that doesn’t sound like much of a rave review, but it’s as simple as the cooking. Uncomplicated dishes done in authentic (for Americans) Jamaican style–but so tasty! And lots of it. Yes, yes, I know large portions don’t automatically make it good, but in this case the portions are a bonus because your leftovers are going to start calling you from the fridge at about 10 o’clock. There’s a surprisingly large vegetarian selection, and the dishes might appear humble, but the flavors fill up every corner of your happy mouth. Don’t be surprised by the random sticks and leaves in the food either because this is real spices and seasonings. Not the powdered pre-blended flavorings in a tine. But real spices. Oh and don’t forget to grab the Scotch Bonnet Hot Sauce if you like that sort of thing. A few suggestions of what not to miss? The Vegan Steak is mellow and tasty. If you like mild curry, the Curry Seitan is worth trying first thing. And the Veggie Mince Special is one of those yummy dishes that varies from day to day but is always good. Some delish little bits and pieces to try–the Dutty Fries (pronounced like ‘dirty’ without the ‘r’, for all of you white folk), the festivals, and smoothies. Some dishes on the menu are kind of spicy, so look out for these… like anything labeled ‘jerk’. 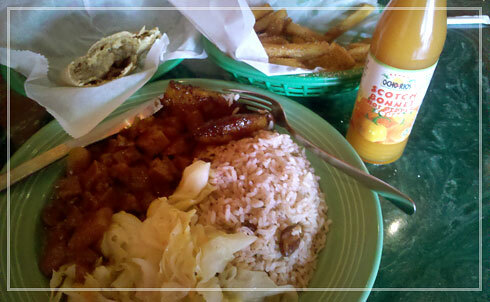 Most dishes come with rice and peas, steamed cabbage, and fried plantains. The rice and cabbage is better than it sounds or looks. I personally haven’t warmed to the whole plantains thing, but The Man munches them up like a Hungry Hungry Hippo. There’s also sandwiches, which are handy hand-food. And of course if you have non-veggie friends, this is a great place because all the dishes look the same and you don’t feel like the sole rabbit in a wolf-pack. Most lunches are going to be around $8 to $10, plus whatever nice extras you indulge in. And it’s worth every penny. I always have a to-go box when I walk out of there. And speaking of to-go, this is one of the great carry-out places since it’s yummy food that can be easily reheated or eaten right out of the box while you sit in front of your computer. A lot of locals and fans remember Reggae Shack back when they were in the original cramped storefront, but with their expansion, there’s much more space. The bright walls make great photos by the way, so take lots of pictures of your friends shoveling food into their mouths. (Great Facebook fodder.) Good music, cheerful staff, and great location make this relaxed restaurant a fun gathering place. Open every day from 11AM to 10PM too, so awesome for those late dinners…nom nom nom.